I recently took part in Scott Kelby's Annual Worldwide Photo Walk. I hadn't heard of the event until a colleague of mine mentioned it to me this year, but it seems like a really cool organization. On a given day, photographers from all over gather in various locations --anyone can start their own walk in any location-- and take pictures together. I thought it would be good to meet and collaborate with some new people, and I jumped at the chance when I saw there was a walk at the Ramapo Reservation, a place I've hiked at before but always wanted to photograph in the fall. Here are some of my best shots from the walk. I had a great time, but would love to go back again soon and see how the leaves look later in the fall. An annual display of over 5,000 hand-carved jack 'o' lanterns, The Great Jack O'Lantern Blaze is a celebrated fixture during the Historic Hudson Valley's fall festivities. Located at Van Cortlandt Manor in Croton-on-Hudson, NY, the Blaze is within driving distance of Sleepy Hollow, which has its own array of Halloween-related celebrations this time of year. Here's another rather large batch of pictures from one of my latest gigs - the UCB's 14th Annual Del Close Marathon (a bit of back story: The Upright Citizens Brigade, originally founded by Matt Besser, Amy Poehler, Ian Roberts and Matt Walsh, created the Del Close Marathon after Del Close, one of the pioneers of improvisational comedy, passed away in 1999). This was, by far the COOLEST photography gig I've gotten so far. Three straight days of improv, performed by the best comedians in the business, and all I had to do was sit in the front row and take pictures. I'd always assumed there was more to improv than Michael Scott continuously pulling out his "gun" (see: The Office), but I had no idea how much of a fine craft it really is. Or how much hard work and training it takes to be a professional improv comedian. I knew there were going to be some big names at the marathon (after all, one of the UCB's founding members is Amy Poehler, one of the most successful female comedians out there), but I was surprised at how many familiar faces I saw on the various stages. From minor recurring TV characters, to frequent supporting roles, even my favorite YouTube sketch comedy groups, it was interesting to see how wide the UCB network spans. Basically, if I ever decide to become a comedian, this would definitely be the place to start. Anyhoo, without further ado, PICTURES! Here are the production stills for Hopeless Romantic, a film my friends at Tanaka Bros. are working on. This was quite a learning experience for me, not just from being on my first movie set, but also from jumping into the medium of production still photography from scratch. Editing was quite a chore, narrowing a collective batch of about 1250 pictures down to a somewhat-comprehensive 136. I like to think these pictures tell a relatively concise story, showing some behind-the-scenes action, some of the scenery, and a little bit of impromptu celebrating after we wrapped filming. This was a pretty surreal experience, working well into the night for several nights in a row, witnessing the production of what I'm sure will be an impressive piece of filmmaking. 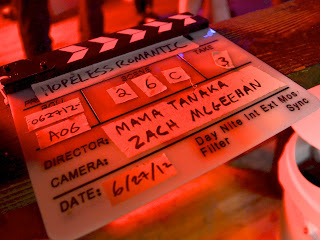 I'll say one more "Congrats" to the cast/crew of Hopeless Romantic - can't wait to see the final product! Labels: 718 Cyclery, Brooklyn, Hopeless Romantic, New York City, production stills, Tanaka Bros.
Today I took some publicity pictures for some good friends of mine who are producing a play called GRAVITY. The show is described as a "story of a war torn world rule by and evil overlord and the four superheroes who band together to defeat her and save their planet." I've performed with these folks before, in a show called ENTOMO, so I can say from personal experience that they know how to put on a show. I'm very excited to continue working with them on this production - and to see the show itself, which promises to be mind-blowing as always. Here are pictures from my latest shoot at the Met - an improv show by The Upright Citizens Brigade touring company, featuring SNL's Bobby Moynihan. The event coincides with the museum's Infinite Jest exhibit.